Remember how I said I love me a good, grilled kebab? Well, that fact doesn’t begin and end with BBQ Chicken Kebabs. No siree. These grilled steak kebabs are dee-vine in their own right. It all just depends on whether you belong to the steak kebab camp or the chicken kebab camp. I am personally honored to announce I belong to both camps. Thanks to a quick marinade composed of soy sauce, garlic, olive oil and a bit of salt and pepper, the steak and veggies are infused with simple flavor and the cooked meat is bursting with juicy tenderness. 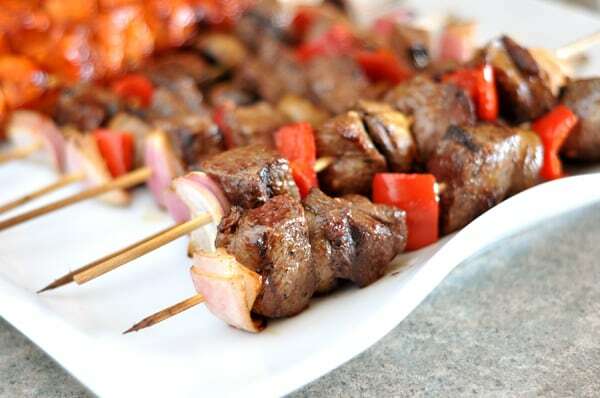 Sometimes the best recipes are the simplest and these kebabs prove that to be true. Simple, flavorful and utterly delish. In a small bowl, whisk together the soy sauce, olive oil, garlic and pepper. Transfer 1/3 cup of the mixture to a large microwave-safe bowl. Place the remaining mixture in a gallon-size ziploc bag and add the meat, tossing lightly. Press the air out of the bag, seal and refrigerate for at least 1 hour or up to 2 hours (don’t marinate longer than 2 hours or the beef will be too salty). Add the bell peppers, onion and mushrooms to the bowl with the reserved soy sauce mixture and toss to coat. Wrap tightly with plastic wrap and let marinate for 30 minutes. Microwave the vegetables until the onions are translucent at the edges, about 3 minutes, stirring halfway. Uncover the vegetables and set aside until the meat is fully marinated. Thread the meat onto the skewers, distributing the veggies among the pieces of meat. Grill the kebabs over medium heat, covered, turning frequently, until the meat is well browned and vegetables are tender, about 14-16 minutes. Serve. We made these tonight for dinner. We don’t have a grill, so we just broiled it in the oven, but I sprinkled Parmesan cheese on all sides of the skewers and it was AMAZING! Thanks for another quick easy dinner. Loved it! I tried making kabobs with hanger steak cut cross grain instead of sirloin. Very good beefy taste and tender. Made these today and they were great! This was my first time making kebabs and these turned out perfect. They were flavorful and tender and everyone liked them. I will definitely be making these more often! I can’t wait to try the chicken kebabs as well. Super delicious! My whole family (5 kids + hubby) loved them – adding them to our summer rotation. I love that I don’t have to marinade everything for hours so if I don’t get going on dinner prep in the morning these are still a possibility. I tried this recipe on my new grill i got as a gift from my wife “Kabobeque BBQ Grills”. We aren’t experienced with kebabs, so we played it safe yesterday and used this recipe but just grilled steaks with the marinade and oven roasted the veggies and it turned out awesome! 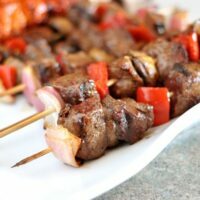 I really want to try the kebabs but my hubby didn’t want to risk not getting it right for our holiday dinner, but I’m looking forward to trying the kebab way soon! These were a HUGE hit at our 4th of July celebration and my first experience grilling kebabs, yay! making this for July 4th. thanks!! This was a HUGE hit with my family. My son declared it the “Best Dinner EVER!” Thanks so much. We’ll be making this on a regular basis I’m sure! This was the BEST kebab recipe EVER! The first time I made this, my family was begging for more, so now I practically have to triple the recipe (we have 7 people to feed)! Thanks for the great recipe! These are awesome. Totally awesome. I used orange peppers because I had them from my co op, and tri tip and vidialia onions, because that’s what I had. They were incredible. I loved the mushrooms….oh I will be making these lots this summer. Thanks for the hundredth recipe I have tried from your site and loved! Made these for dinner tonight and they were scarfed by my husband in ten seconds. We used elk meat and since our townhouse complex won’t allow bbq-ing (thanks to some genius who set their porch on fire), I had to cook them in the oven. 350 for 7 min each side. They were perfect. Thanks a million! I’ve made these twice this summer and they’re amazing! The marinade is perfect and so easy. Definitely a keeper! Meant to say the microwaving really was a very good idea. Everything was cooked at the same time. Forgot – we also used chunks of red onion. Loved this! We used mushrooms, red/yellow peppers, and steak. Delicious. So tender. Can’t believe I have some of those packaged kabobs in the freezer – won’t be wanting to eat those anytime too soon. They always stick to the bbq and just don’t taste juicy. These were excellent. My boys gave it a thumbs up! Tried this using a Sirloin Tip Roast. The meat was very, very tough. Any suggestions? Angie – I’m not sure why the meat would have been so tough (I’m not a guru on different types of meat but I’m guessing that sirloin tip roast is similar to a sirloin steak roast or steak tips). It’s a good idea to cut the meat against the grain to help with tenderness but other than that, I’m sorry about the toughness – these have always been super tender when I’ve made them and I usually use a sirloin roast or sirloin steaks. I made the chicken kebobs last weekend and was told, “THIS IS THE BEST THING YOU’VE EVER MADE! With that said, I’m making the chicken AND the steak kebobs this 4th of July weekend 🙂 Thank you again for your delicious recipes, they are awesome! Yummy! I love kabobs. This is perfect for the summer grilling season. Love this, yummy! I fill mine with peppers, onions and cherry tomatoes. 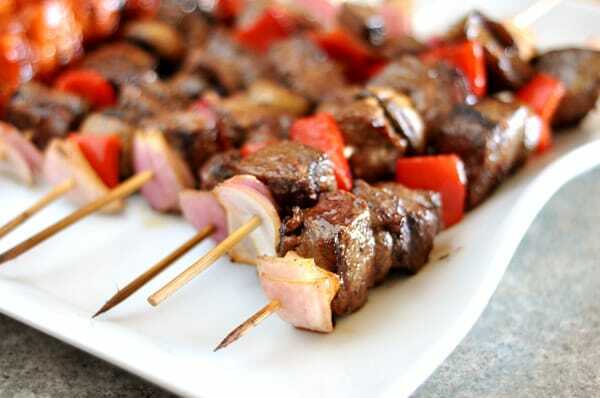 We just had steak kebabs last night, but the soy marinade sounds delicious, I want to try these soon! We love kebabs at our house! I usually add in some fresh, chunked pineapple. Oh so delish! I find the microwaving of the vegetables a very smart trick. I haven’t done much with kebabs. And I’d have to do them on my stove top grill. Why not?